This is a northern range species in North America that is generally stable except for some edge of range declines to extirpation in Minnesota, Illinois, and Ohio. It has a range extending from Indiana and Michigan to southeastern Minnesota, Iowa, southeastern Kansas, Missouri, Oklahoma, Arkansas and Kentucky, and has apparently been extirpated from Ohio. Out of 28 stations recently surveyed along the Tittabawassee River of Michigan, a tributary to the Saginaw, the species was present at 16 and abundant at eight stations. Currently, the species is found at 11 sites in five southeastern Wisconsin river systems. It also occurs in the Fox River drainage in the southwestern part of the state. In Kansas, range is restricted to the Spring River in the southeastern corner of the state and the mussel is considered a peripheral species. In Missouri, range formerly covered areas north of the Missouri River. Current range is the streams that flow north off the Salem and Springfield Plateaus. The first record from Minnesota was from the Cannon River in 1987. Within the Cannon River watershed, extant populations were discovered in the Straight River, Wolf Creek and the Cannon River proper. The largest population was found within the tailwaters of an old mill dam on the Straight River; 2 live and 3 dead shells were found in June 2005. Although presently limited in distribution within the drainage, past distribution appears to have been much wider. Subsequent to the Cannon River survey, sites have been found in other river systems within the southeastern corner of the state, the Zumbro and tributaries to the Root. In 1800 sample sites across all of Minnesota (almost 500 from the St. Croix drainage and drainages in southeastern Minnesota) the species was found in 219 sites in five primary tributaries to the Mississippi River: the Cannon, Cedar, Root, Upper Iowa, and Zumbro River systems; with no relic shells in any other systems. 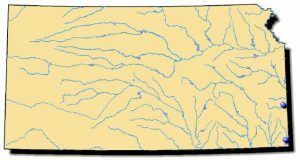 In Iowa, range is the upper reaches of rivers in the northeastern third of Iowa. Although some records are available from large rivers (judging from recent records of this species from the Mississippi River at Davenport, Muscatine, Prairie du Chien and Keokuk, it is rarely found in large river habitats. There have been no records in the state of Ohio. Although some records also exist in Lake Erie tributaries, none of these are from Ohio. The ellipse was historically found in the northern half of Illinois, particularly in the northeast. However, many streams in that part of Illinois have been negatively effected by urban development and agricultural impacts and many populations have been extirpated. The ellipse is now relatively uncommon in Illinois. A few apparently healthy populations can still be found in tributaries to the Kankakee, Fox, Mackinaw, and Vermilion (Illinois River drainage) rivers. 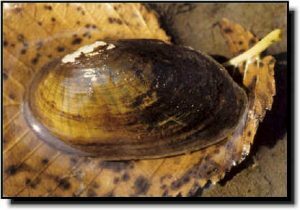 This mussel is rare in Indiana occurring only at a few sites primarily in streams draining into Lake Michigan. A few historical records exist for glacial lakes in the headwaters of the Tippecanoe River. Comments: As a full-grown mussel, the ellipse is still relatively small. The straw-colored shell has numerous dark rays that radiate from the umbo of the shell. It is a mussel restricted to small, upland Ozark streams. In Kansas, it is only found in the Spring and Marmaton rivers. It is dimorphic with the male being narrower in height than the female. Typically, the females release glochidia in the early morning hours. The glochidia must attach to a host fish or they will perish. The number of glochidia released per female is directly related to her size.